A recent study by Transparency Market Research (TMR) has identified Sciessent LLC, The Dow Chemical Company, Takex Labo Co. Ltd., and BASF SE are the leaders in the global antimicrobial packaging market. The TMR study expects the competition to get stiffer in the near future with the entrance of new players across all regions. The leading players in the global antimicrobial packaging market are expected to venture into untapped regions such as MEA and Latin America, particularly targeting the healthcare sector, which is proving to be a promising end-user industry. With vast population base, Asia Pacific region is in prime focus of most of the key players in the global antimicrobial packaging market, aspiring to make their market before it gets consolidated. 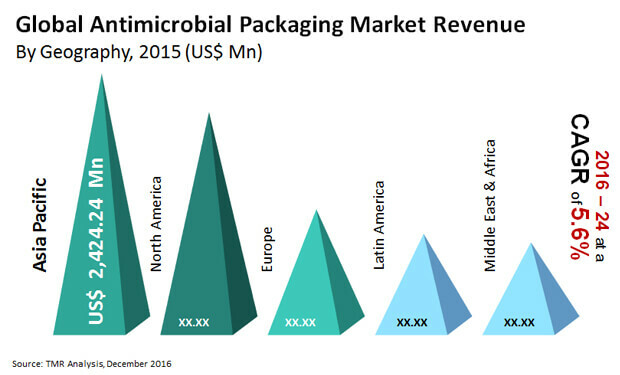 As per the estimations provided in the report, the global market for antimicrobial packaging was worth US$10.28 bn in 2016, which will increment to US$15.31 bn by 2024, expanding at a CAGR of 5.1% during the forecast period of 2016 to 2024. Some of the other key players in this market according to the TMR report are Barr Brands International, Mondi PLC, LINPAC Senior Holdings Ltd., PolyOne Corporation, BioCote Ltd, and Dunmore Corporation. Based on material, the TMR report segments the global antimicrobial packaging market into plastic, biopolymer, paperboard, glass, and tin. Though the plastic antimicrobial packaging segment served the maximum demand at 43.3% in 2015, the future prospects appear bleak. On the others, the demand for biopolymer and paperboard segments are expected to escalate quickly during the forecast period. Biopolymer-based packaging materials include natural biopolymers such as proteins and starches, biopolymer blends, synthetic biopolymers such as polylactic acid, and nanocomposites based on natural and synthetic biopolymers. Based on package type, the report categorizes the market into bottles and cans, pouches, trays, carton packages, bags, and cup and lids. Among these, pouches obtained maximum demand in 2015 and are anticipated to remain profitable owning to continued demand from the food and beverages industry for packaging of products in smaller quantity. Geographically, Asia Pacific contributed the maximum share of the demand at 33.3% in 2015, which was a reflection of the climatic condition in the region which leads to food spoilage and therefore there is high demand for antimicrobial packaging. North America is the second most profitable region for the players in the antimicrobial packaging market, owing to the large convenience food market which requires antimicrobial packaging for extended shelf life. Increase in demand for food and beverages with longer shelf life is the primary driver of the global antimicrobial packaging market. Antimicrobial packaging helps to store food items which makes them consumable for a longer period of time. As this kind of packaging prevents the growth of microorganisms, it increases the shelf life of products and reduces wastage. In addition to that, growing consumer awareness about health related issues and increase in consumption of processed food are other two important factors that augur well for the future of the global antimicrobial packaging market. On the other hand, stringent regulations by governments pertaining to the addition of antimicrobial agents directly into food and food wrapping films is hindering the growth rate.